A fun, entertaining, and creative fairy tale filled with terrific musical numbers. The Little Mermaid is a classic Disney movie. In fact, it is really the movie that launched animated films into the mainstream. It is the reason why we have movies like Madagascar 3 and kung fu panda 2 today. Before 1989, there were not many animated films. There were movies that came out every few years and were entirely for kids, like The Aristocrats or 101 Dalmatians. 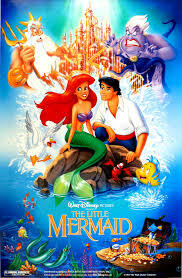 The little mermaid came out in 1989 and changed all of that. Everybody fell in love. Two years later was Beauty and the Beast, then Aladdin, and then The Lion King. Those four films will always be the cannon of great Disney classics that relaunched the genre. Sure there were original animated films like snow white, sleeping beauty, Dumbo, and Bambi which went back some decades, but those movies were very dated and like the others, were strictly for kids. The four Disney classics were the movies that changed everything. In addition, the year after the lion king came out, we got Toy Story, the movie that launched us into the world of CG animation. From there, there was no looking back. The little mermaid worked so well for a number of reasons. First off, it took us into a new world. That is the world under the sea. It is filled with fish, crustaceans, mermaids, and mermen. It is run by King Triton, Ariel’s father. She is The Little Mermaid, who the title refers to. In addition, she is one of many of triton’s daughters. However, she is the most special one. We learn this early on when the girls do a musical performance that is all leading up to the introduction of Ariel. In addition, of course, she is not there. That is how this movie, right away, differs itself from the Disney movies that came before. Its characters are smarter and have more personality. Ariel is not there because she is out exploring a ship with her friend, Flounder (a cute yellow fish), searching for lost treasures. Only her treasures are not gold and silver, but just anything human. Any human object. Ariel is curious and interested in the human world. 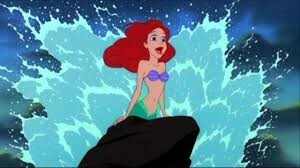 Another movie would have actually opened with a lively musical number and have Ariel be the star of the show. This one uses the musical number to show that she is not there, and is too busy being curious and inquisitive to remember the show. The real story begins when Ariel saves a young man named prince Eric from a shipwreck, rescues him from drowning, and decides she wants to be a human so that she can start a romance with him. In order to do this, she has to make a deal with the evil sea witch, Ursula. She goes to see Ursula and we get one of many great songs. This one is called “Poor Unfortunate Souls.” before this, when Ariel sang about her fascination with the human world she sang the song, “Part Of Your World.” And when Sebastian, he friend the crab, tried to convince her that the sea life is better than the human life, he sang, “Under The Sea,” which is the best song in the whole movie, as it is entirely devoted to showing a celebration of the underwater world. Ariel signs a deal with the sea witch to make herself into a human for a period, but there are conditions. In addition, this is where the movie gets cool. Condition one is that Ariel must get Eric to fall in love with her within three days. If she does not do this by sunset on the third day, her soul will belong to Ursula. Something like that. She will turn into one of her little shrimpy creatures that look like pond scum and cannot talk. Condition two is that Ursula will get Ariel’s voice. She is not going to make it so easy for Ariel to win over Eric. Ariel will have to do it without talking. As Ursula says, “she’ll have her looks, her pretty face, and body language.” of course the looks, and pretty face is really the same thing, but what Ursula should really be saying is personality. Therefore, Ariel gives up her voice by singing and watching her voice leave her throat in the form of a musical light. Ursula captures it in a seashell necklace and wears it around her neck. It is a very cool moment. That pretty much ends the first half of the movie. The second half is all about the three days on land with Ariel trying to win over Eric. She gets to stay at his palace right away, which is a help, but without speaking, things are not as easy as they should be. For example, Ariel cannot tell Eric that she is the one who saved him. The movie does not consider that she could have probably written it to him, but that is okay. Let us just say that Ariel does not know how to write and solve that problem easily. The movie does a nice job of showing how these three days play out. The first day involves Eric meeting Ariel and taking her in. We get a very funny scene with Sebastian being chased around the kitchen by a crazy chef and crashing into things left and right. In addition, by the end of the day, it has been decided that Eric will spend the next day showing Ariel the kingdom. That is what the second day is all about and as things start to seem like they might work out, Ursula devises an evil plan. The movie is filled with cool plot twists and changes in the storyline like that. Nothing works out neat or simple, and that is a good thing. We get a giant ending with a big event that turns into a massive showdown, and it is all a lot of fun. This is a very exciting and very clever movie. The two worlds thing is great, but what makes it really work is that half the movie is in one world and the other half in the other. The other thing that is great about the movie is the deal and the conditions. Having only three days, for example, really sets up the second half of the movie nicely. In addition, the songs on hand here are all fantastic. There are not too many of them (four or five in all), and each one of them is done really well. The Little Mermaid is a fantastic movie, and proof of that is the way it inspired animated films to come back into the mainstream. Finally, they were not just for kids. Adults fell in love with too these movies.